Not only is Miami the starting point for a good number of cruise vacations to the Caribbean and elsewhere, it is a vibrant city offering visitors countless recreational and sightseeing opportunities. When arriving for a cruise from Miami, take the time to explore the city, its beaches and its historical neighborhoods. The tourist options are far too numerous to mention in detail, but plan on a fun-filled day in South Florida before or after the cruise itself. Besides, part of the fun of traveling is the attractions found everywhere the plane touches down, and Miami will not disappoint those who take a day or two to explore its many wonderful secrets. There is a large cruise port facility on the waterfront directly in front of the central business district. Passengers arriving in Miami via ship can literally walk to the center of downtown, but will likely have a free shuttle service available as part of their cruise itinerary. Taxis, public bus service and even rental cars are available at the docks, and there is a visitor information center in the main terminal. Miami is known for its historical neighborhoods and the most famous district in the city is the Art Deco district, located along the South Beach waterfront area from 6th to 23rd Streets and containing a number of antique shops, art galleries and remodeled buildings. There are also a collection of fine - and funky - restaurants in the vicinity, along with souvenir shops selling outrageous t-shirts, anti-fashion outerwear and every type of shoe and boot found on the planet. 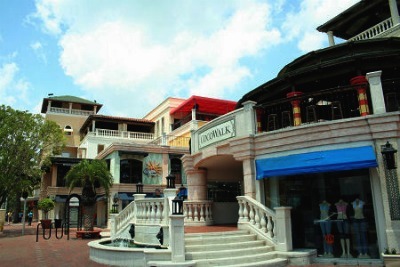 The Coconut Grove district is one of the oldest in the city and has a huge number of residences and other structures dating back a century. There are also museums, including the very nice Vizcaya Museum, a Renaissance-style estate, and small clothing boutiques that are located on nearly every street corner. 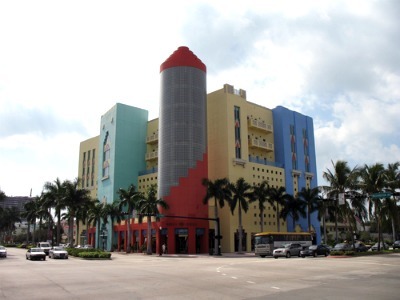 Along SW 8th Street is the delightful area known as Little Havana, where tourists watch handmade rolled cigars being completed at several different shops, and where one finds the Cuban Museum of the Americas. If renting a car, visitors will enjoy driving across the bridge to Key Biscayne where the famous Miami Seaquarium is located at 4400 Rickenbacker Causeway. There is no end to the fine dining opportunities in Miami, and the cuisine varies from traditional American to European Continental, West Indies barbeque and Cajun. The outdoor patio at La Marea at the Tides at 1220 Ocean Avenue provides an open air dining experience and is a favorite for people watching. On SW 8th Avenue in Little Havana there is scrumptious fare at the Versailles Restaurant, offering such delicious courses as picadillo, ropa vieja and other spectacular entrees known throughout the Caribbean but new to many visitors. And there are plenty of Burger Kings and Outback Steakhouses in Miami, as both of these popular chains have their world headquarters in Florida. Walking distances in downtown are not great, but to see the sights one should consider a car rental. There are free shuttles for passengers arriving at Miami International Airport in connection with their cruise, but these buses take visitors only to downtown or to the docks. Public buses are numerous and connect all the outlying neighborhoods, and the taxi drivers are familiar with all the popular boutiques and restaurants in the South Beach area. The port area is quite large and passengers should become familiar with the area where their ship is docked; most cruise packages have a detailed port map sent to all passengers. ATMs are found outside any downtown bank branch, and most of the popular restaurants, museums and hotels have bilingual staff. Spanish is spoken by a good percentage of the local population as either a first or second language, and for those needing to communicate home and are not carrying a cell phone, Internet cafes are found throughout the South Beach and Art Deco districts. 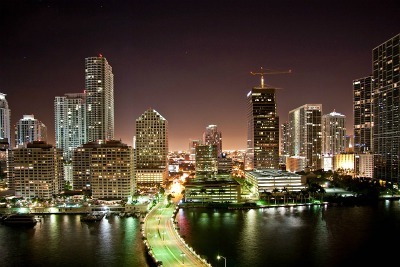 And be prepared for rapidly changing weather when visiting Miami. Rain, wind, scorching sun and ground fog can all be experienced in as little as two hours. 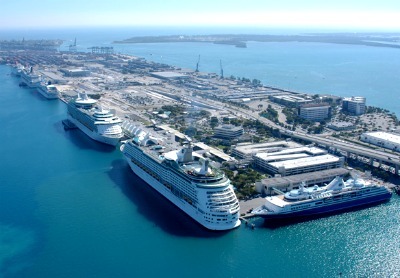 Miami has a very large cruise port, with many cruise ships departing and arriving every day. An interesting building in Art Deco district of the city. 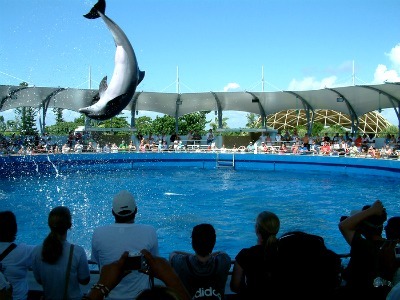 You should visit Miami Seaquarium if you get a chance.